You are looking for a baking-, cooking- and and separation paper with premium quality? With the best release effect? With a long history and tradition? That’s what Blechrein stands for - and that for more than 50 years. Germany is the land of poets and thinkers, inextricably linked with the works of Goethe, Schiller, etc. – or with simple inventions that changed the world. It is this wealth of ideas that is the driving force behind the German economy. How does this relate to Blechrein? With its wide range of papers for every occasion – be it greaseproof, heat-resistant or non-stick coated – Blechrein products have all been developed specially for the food sector. Is there a specific application that you’re interested in but haven’t found in our standard range? Our Blechrein lines can be ordered here in small quantities as well as for private use. With its versatile offer, Blechrein offers the right paper for every occasion, which we customize to your individual needs. Our customers and their products are at the center of our actions. This is appreciated by well-known companies all over the world. 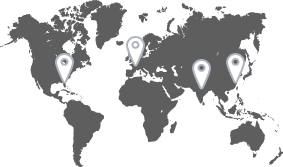 Blechrein is represented on four continents and has a worldwide production and sales network. Thanks to DIN ISO 14001 certified work processes, as well as products made from natural, fully recyclable paper and pulp, Blechrein protects the enviroment. As a manufacturer, we have all the development and production processes in our hands. Blechrein ensures product quality in optimized work processes, certified according to DIN ISO 14001.